One of the frightening things about a system in equilibrium is what happens when you perturb it. Within limits, most systems can recover from perturbation through some combination of negative feedbacks. An example is your body temperature. If something makes it goes up -- exercise, for example, or being outside on a hot, humid day -- you sweat, bringing your temperature back down. If your body temperature goes down too much, you increase your rate of burning calories, and also have responses like shivering -- which brings it back up. Those combine to keep your temperature in a narrow range (what the biologists call homeostasis). Push it too much, though, and the whole thing falls apart. If your temperature rises beyond about 105 F, you can experience seizures, convulsions, brain damage -- or death. Your feedback mechanisms are simply not able to cope. This, in a nutshell, is why climate scientists are so concerned about the effects of anthropogenic carbon dioxide. Within limits -- as with your body temperature -- an increase in carbon dioxide results in an increase in processes that remove the carbon dioxide from the atmosphere, and the whole system stays in equilibrium. There is a tipping point, however. The problem is that no one knows where it is -- and whether we may have already passed it. A new piece of research from the Virginia Polytechnic Institute has indicated that this flip from stability to instability may be fast and unpredictable. A paper authored by a team led by paleobiologist Shuhai Xiao, that came out last month in Geology, looks at one of the main destabilization events that the Earth has ever experienced -- when the "Snowball Earth" thawed out in the late Precambrian Period, 635 million years ago. Xiao and his team studied rocks from Yunnan and Guizhou, China, that are called cap carbonates. They are made of limestone and dolomite and are deposited quickly in marine environments when the carbon dioxide content of the atmosphere spikes, leading to a dramatic temperature increase and a subsequent increase in absorption of carbonates into seawater (and ultimately deposition of those carbonates on the seafloor). The cap carbonates Xiao et al. studied were dated to between 634.6 and 635.2 million years old, which means that the entire jump in both temperature and carbon dioxide content took less than 800,000 years. 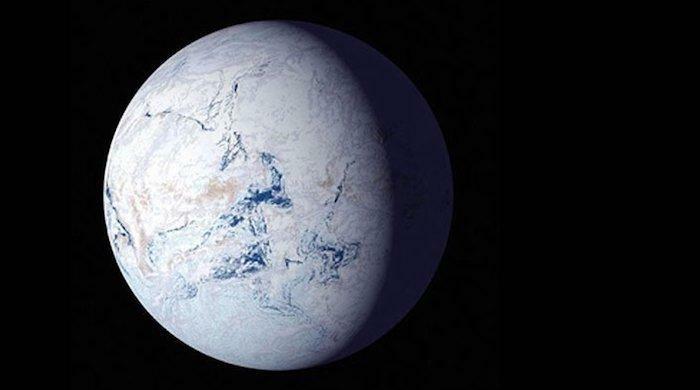 So in less than a million years, the Earth went from being completely covered in ice to being subtropical. The jump in global average temperature is estimated at 7 C -- conditions that then persisted for the next hundred million years. Xiao et al. describe this as "the most severe paleoclimatic [event] in Earth history," and that the resulting deglaciations worldwide were "globally synchronous, rapid, and catastrophic." Carol Dehler, a geologist at Utah State University, is unequivocal about the implications. "I think one of the biggest messages that Snowball Earth can send humanity is that it shows the Earth’s capabilities to change in extreme ways on short and longer time scales." What frustrates me most about today's climate change deniers is that they are entirely unwilling to admit that the changes we are seeing are happening at an unprecedented rate. "It's all natural," they say. "There have been climatic ups and downs throughout history." Which is true -- as far as it goes. But the speed with which the Earth is currently warming is faster than what the planet experienced when it flipped between an ice-covered frozen wasteland and a subtropical jungle. It took 800,000 years to see an increase of the Earth's average temperature by 7 degrees C.
The best climate models predict that's what we'll see in two hundred years. And that is why we're alarmed. It's unknown what kind of effect that climate change in the Precambrian had on the existing life forms. The fossil record just isn't that complete. But whatever effect it had, the living creatures that were around when it happened had 800,000 years to adapt to the changing conditions. What's certain is that an equivalent change in two centuries will cause massive extinctions. Evolution simply doesn't happen that quickly. Organisms that can't tolerate the temperature fluctuation will die. We can only speculate on the effects this would have on humanity. This is clearly the biggest threat we face, and yet the politicians still sit on their hands, claim it's not happening, that remediation would be too costly, that we can't prevent it, that short-term profits are more important than the long-term habitability of the Earth. Our descendants five hundred years from now will look upon the leaders from this century as having completely abdicated their responsibility of care for the people they represent. Presuming we still have descendants at that point. This week's Skeptophilia book recommendation combines science with biography and high drama. It's the story of the discovery of oxygen, through the work of the sometimes friends, sometimes bitter rivals Joseph Priestley and Antoine Lavoisier. A World on Fire: A Heretic, an Aristocrat, and the Race to Discover Oxygen is a fascinating read, both for the science and for the very different personalities of the two men involved. Priestley was determined, serious, and a bit of a recluse; Lavoisier a pampered nobleman who was as often making the rounds of the social upper-crust in 18th century Paris as he was in his laboratory. But despite their differences, their contributions were both essential -- and each of them ended up running afoul of the conventional powers-that-be, with tragic results. The story of how their combined efforts led to a complete overturning of our understanding of that most ubiquitous of substances -- air -- will keep you engaged until the very last page.